Occasionally I find myself at the apex of both someone wanting to sell a KHSD multi, and someone looking for that vessel. It changes rapidly, so call or email to see if anything has come to my attention. Consider the advantages of having the designer involved in your multihull purchase. I probably know much more about that boat than the typical slacker monohull salesman does. I work with a broker who is familiar with that biz. So you get both of us helping you. I also offer a buyers's consultation service. 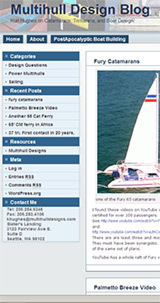 I get many requests from people asking for information about one of my multihull designs they are interested in buying. I offer a consultation service that gives the client ongoing phone and email access to me. It also allows you to have the plans sheets of that design to help you understand how it was built and if it was built as designed. I offer this service for $500.